Most areas in North America and Europe and some areas in the Middle East observe daylight saving time (DST), while most areas of Africa and Asia do not. In South America, most countries in the north of the continent near the equator do not observe DST, while Paraguay and most of Chile do. The practice of observing daylight saving time in Oceania is also mixed, with New Zealand and parts of southeastern Australia observing DST, while most other areas do not. Albania Europe Northern Last Sunday March Last Sunday October Observed DST in 1940–1943, and since 1974. Algeria Africa Northern – – Observed DST in 1916–1921, in the autumn of 1939, in 1944–1945, 1971, 1977–1978 and 1980–1981. Andorra Europe Northern Last Sunday March Last Sunday October Observed DST since 1985. Argentina South America Southern – – Observed DST in 1930–1969, 1974, 1988–2000, 2007–2009. Armenia Asia Northern – – Observed DST in 1981–1995, 1997–2011. Austria Europe Northern Last Sunday March at 01:00 UTC Last Sunday October at 01:00 UTC Observed DST in 1916–1918, 1920, 1940–1948 (as part of Germany between 1940–1945) and since 1980. Bahamas, The North America Northern Second Sunday March First Sunday November Observed DST since 1964. Bangladesh Asia Northern – – Observed DST during World War 2 from 1942–1945 as a part of the Bengal Presidency of India. Also observed in 2009. Barbados Central America Northern – – Observed DST from 1977–1980. Belarus Europe Northern – – Observed DST in 1941–1944, 1981–2010. Belgium Europe Northern Last Sunday March at 01:00 UTC Last Sunday October at 01:00 UTC Observed DST in 1916–1940, 1942–1946 and since 1977. Belize Central America Northern – – Observed DST in 1973–1974 and 1982–1983. Bermuda (UK) North America Northern Second Sunday March First Sunday November Observed DST since 1974. Bolivia South America Southern – – Observed DST in 1931–1932. Socialist Federal Republic of Yugoslavia. Botswana Africa Southern – – Observed DST in 1943–1944. Brazil South America Southern & Northern – – Observed DST in 1931–1933, 1949–1953, 1963–1968, and 1985–2019. Bulgaria Europe Northern Last Sunday March at 01:00 UTC Last Sunday October at 01:00 UTC Observed DST in 1943–1944 and since 1979. Nunavut (Southampton Island) do not observe DST. Saskatchewan, however, observes Central Time even though it is located in the Mountain Time Zone, meaning it effectively observes DST year round. Cape Verde Africa Northern – – Observed DST in 1942–1945. Chad Africa Northern – – Observed DST in winter 1979–1980. Easter Island which observed it in 1932–1946) and from 1968–2015. Chile observed year-round DST in 2015, but reintroduced regular DST in 2016. Magallanes Region does not observe DST since December 2016. China Asia Northern – – Observed DST in 1940–1941,1986–1991. 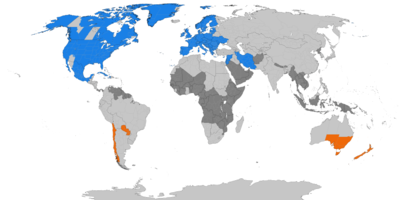 In 1980, UTC+5, UTC+6, UTC+7, UTC+9 all changed to UTC+8 to entire country. Colombia South America Northern & Southern – – Observed DST in 1992–1993. Cook Islands Oceania Southern – – Observed DST in 1978–1991. Costa Rica Central America Northern – – Observed DST in 1954, 1979–1980 and 1991–1992. Austria-Hungary, in 1941–1945 and since 1983. Cuba Central America Northern Second Sunday March First Sunday November Observed DST in 1928, 1940–1942, 1945–1946 and since 1965. Cyprus Europe Northern Last Sunday March at 01:00 UTC Last Sunday October at 01:00 UTC Observed DST since 1975. Northern Cyprus maintained permanent DST from September 2016 to October 2017. Czech Republic Europe Northern Last Sunday March at 01:00 UTC Last Sunday October at 01:00 UTC Observed DST in 1916–1918, 1940–1949 and since 1979. Denmark Europe Northern Last Sunday March at 01:00 UTC Last Sunday October at 01:00 UTC Observed DST in 1916, 1940–1948 and since 1980. Dominican Republic Central America Northern – – Observed DST in 1966–1967, 1969–1974. Egypt Africa/Asia Northern – – Observed DST in 1940–1945, 1957–2010 and 2014–2015. An attempt to restore daylight saving after Ramadan was rejected by the Egyptian parliament on July 4, 2016 and currently has no plans to use DST in the future. El Salvador Central America Northern – – Observed DST in 1987–1988. Estonia Europe Northern Last Sunday March at 01:00 UTC Last Sunday October at 01:00 UTC Observed DST in 1918, 1940–1944, 1981–1988, 1997–1999 and since 2002. Faroe Islands (DK) Europe Northern Last Sunday March Last Sunday October Observed DST since 1981. Falkland Islands (UK) South America Southern – – Observed DST in 1937–1942 and 1983–2010. Observed DST in 1998–2000 and since 2009. Finland Europe Northern Last Sunday March Last Sunday October Observed DST in 1942 and since 1981. France Europe Northern Last Sunday March at 01:00 UTC Last Sunday October at 01:00 UTC Observed DST in 1916–1945 and since 1976. Georgia Europe/Asia Northern – – Observed DST in 1981–2005. Germany Europe Northern Last Sunday March at 01:00 UTC Last Sunday October at 01:00 UTC Observed DST in 1916–1918, 1940–1949, and since 1980. Ghana Africa Northern – – Observed DST from 1936–1942. Greece Europe Northern Last Sunday March at 01:00 UTC Last Sunday October at 01:00 UTC Observed DST in 1916–1918 and since 1971. Greenland (DK) North America Northern Saturday before last Sunday March at 22:00 local time on Saturday before last Sunday October at 23:00 local time on Observed DST since 1980. Follows European Union practice as part of the Kingdom of Denmark, hence start & end times correspond to 01:00 UTC on the respective Sunday. See Daylight saving time in the Americas—Greenland Qaanaaq uses US and Canada rules. Danmarkshavn has not observed DST since 1995. Guatemala Central America Northern – – Observed DST in 1973–1974, 1983, 1991 and 2006. Guernsey (UK) Europe Northern Last Sunday March at 01:00 UTC Last Sunday October at 01:00 UTC Observed DST in 1916–1968 and since 1972. Haiti Central America Northern Second Sunday March First Sunday November Observed DST in 1983–1997, 2005–2006, 2012–2015 and since 2017. Holy See Europe Northern Last Sunday March Last Sunday October Observed DST in 1916–1920, 1940–1948 and since 1966. Honduras Central America Northern – – Observed DST in 1987–1988 and 2006 . Hong Kong (CN) Asia Northern – – Observed DST in 1941, 1945–1976 and 1979. Hungary Europe Northern Last Sunday March at 01:00 UTC Last Sunday October at 01:00 UTC Observed DST in 1916–1920, 1941–1950, 1954–1957 and since 1980. The government considered abolishing DST in 2017, moving Hungary to the UTC+2 (EET) year-round, but there are no official plans to do so yet. This would be problematic considering DST switch is coordinated on an EU level. Iceland Europe Northern – – Observed DST in 1917–1918 and 1939–1968. India Asia Northern – – Observed DST during World War 2, from 1942–1945. Indonesia Asia/Oceania Northern & Southern – – Jakarta observed DST in 1948–1950. Iraq Asia Northern – – Observed DST in 1982–2007. Observed DST in 1977–1980, 1991–2005 and since 2008. Ireland Europe Northern Last Sunday March at 01:00 UTC Last Sunday October at 01:00 UTC Observed DST in 1916–1968 and since 1972. Isle of Man (UK) Europe Northern Last Sunday March at 01:00 UTC Last Sunday October at 01:00 UTC Observed DST in 1916–1968 and since 1972. Observed DST in 1940–1946, 1948–1957, 1974–1975 and since 1985. Italy Europe Northern Last Sunday March at 01:00 UTC Last Sunday October at 01:00 UTC Observed DST in 1916–1920, 1940–1948 and since 1966. Jamaica Central America Northern – – Observed DST in 1974–1983. Jersey (UK) Europe Northern Last Sunday March at 01:00 UTC Last Sunday October at 01:00 UTC Observed DST in 1916–1968 and since 1971. Jordan Asia Northern Last Friday March Last Friday October Observed DST in 1973–1979 and 1985–2011. In 2012 changed time zone to UTC+3, effectively going on permanent DST. Returned to UTC+2 on Dec 20, 2013, and has observed DST since 2014. Kazakhstan Asia/Europe Northern – – Observed DST in 1981–1990 and 1992–2004. South Korea Asia Northern – – Observed DST in 1948–1951, 1955–1960 and 1987–1988. Kosovo Europe Northern Last Sunday March Last Sunday October Observed DST since 1983. Kyrgyzstan Asia Northern – – Observed DST in 1981–2005. Latvia Europe Northern Last Sunday March at 01:00 UTC Last Sunday October at 01:00 UTC Observed DST in 1918–1919, 1941–1944 and since 1981. Lebanon Asia Northern Last Sunday March Last Sunday October Observed DST in 1920–1923, 1957–1961, 1972–1978 and since 1984. Lesotho Africa Southern – – Observed DST in 1943–1944. Libya Africa Northern – – Observed DST in 1951–1959, 1982–1989, 1996–1997 and 2012–2013. Liechtenstein Europe Northern Last Sunday March Last Sunday October Observed DST since 1981. Lithuania Europe Northern Last Sunday March at 01:00 UTC Last Sunday October at 01:00 UTC Observed DST in 1941–1944, 1981–1999 and since 2003. Luxembourg Europe Northern Last Sunday March at 01:00 UTC Last Sunday October at 01:00 UTC Observed DST in 1916–1946 and since 1977. Macau (CN) Asia Northern – – Observed DST in 1961–1980. Madagascar Africa Southern – – Observed DST in 1954. Malta Europe Northern Last Sunday March at 01:00 UTC Last Sunday October at 01:00 UTC Observed DST in 1916–1920, 1940–1948 and since 1966. Martinique (FR) Central America Northern – – Observed DST in 1980. Currently Does not observe DST. Mauritius Africa Southern – – Observed DST in 1982–1983 and 2008–2009. Baja California has observed DST since 1976. Quintana Roo in 2014. Durango, Coahuila, Nuevo León and Tamaulipas observed DST in 1988. Locations less than 20 km from the US border use U.S. DST. Midway Atoll (US) Oceania Northern – – Observed DST in 1956. Moldova Europe Northern Last Sunday March Last Sunday October Observed DST in 1932–1944, 1981–1989 and since 1991. Monaco Europe Northern Last Sunday March Last Sunday October Observed DST in 1916–1945 and since 1976. Mongolia Asia Northern – – Observed DST in 1983–1998, 2001–2006 and 2015–2016. Morocco Africa Northern – – Observed DST in 1939–1945, 1950, 1967, 1974, 1974–1976, and 2008–2018. DST was stopped during Ramadan. Namibia Africa Southern – – Observed DST in 1942–1943. Does not observe DST but implemented winter time in 1994 in all regions except Zambezi. DST was removed in 2017. Netherlands Europe Northern Last Sunday March at 01:00 UTC Last Sunday October at 01:00 UTC Observed DST in 1916–1945 and since 1977. New Caledonia (FR) Oceania Southern – – Observed DST in 1977–1979 and 1996–1997. New Zealand Oceania Southern Last Sunday September First Sunday April Observed DST in 1927–1946 and since 1974. Nicaragua Central America Northern – – Observed DST in 1973–1975, 1979–1980, 1992–1994 and 2005–2006. Norway Europe Northern Last Sunday March at 01:00 UTC Last Sunday October at 01:00 UTC Observed DST in 1916, 1940–1945, 1959–1965 and since 1980. Follows European Union practice, although not a member. British Raj. Also observed in 2002 and from 2008–2009. Paraguay South America Southern First Sunday October Fourth Sunday March Observed DST since 1975. Current start and end dates last updated in 2013. Peru South America Southern – – Observed DST in 1938–1940, 1986–1987, 1990 and 1994. Philippines Asia Northern – – Observed DST in 1936–1937, 1954, 1978 and 1990. Poland Europe Northern Last Sunday March at 01:00 UTC Last Sunday October at 01:00 UTC Observed DST in 1916–1919, 1940–1949, 1957–1964 and since 1977. Portugal Europe Northern Last Sunday March at 01:00 UTC Last Sunday October at 01:00 UTC Observed DST in 1916–1921, 1924, 1926–1929, 1931–1932, 1934–1949, 1951–1965 and since 1977. Puerto Rico (US) Central America Northern – – Observed DST in 1942–1945. Romania Europe Northern Last Sunday March at 01:00 UTC Last Sunday October at 01:00 UTC Observed DST in 1932–1939 and since 1979. Russia Europe/Asia Northern – – Observed DST in 1917–1919, 1921 (some areas) and 1981–2010. In 2011–2014, used permanent DST. In 2014, left permanent DST and switched to permanent standard time. Saint Pierre and Miquelon (FR) North America Northern Second Sunday March First Sunday November Observed DST since 1987. San Marino Europe Northern Last Sunday March Last Sunday of October Observed DST in 1916–1920, 1940–1948 and since 1966. Serbia Europe Northern Last Sunday March at 01:00 UTC Last Sunday October at 01:00 UTC Observed DST in 1941–1945 and since 1983 (did not observe DST as part of Yugoslavia, from 1918–1941, and 1945–1983). Sierra Leone Africa Northern – – Observed DST in 1935–1942 and 1957–1962. Singapore Asia Northern – – Observed DST in 1933–1935 by adding 20 minutes to standard time. On January 1, 1936, country changed their time zone to UTC+07:20. Slovakia Europe Northern Last Sunday March at 01:00 UTC Last Sunday October at 01:00 UTC Observed DST in 1916–1918, 1940–1949 and since 1979. South Africa Africa Southern – – Observed DST in 1942–1944. South Sudan Africa Northern – – Observed DST in 1970–1985. Canary Islands DST observed since 1980. Sri Lanka Asia Northern – – Observed DST during the Second World War, from 1942–1945 just as the rest of the Indian subcontinent. Sudan Africa Northern – – Observed DST in 1970–1985. Sweden Europe Northern Last Sunday March at 01:00 UTC Last Sunday October at 01:00 UTC Observed DST 15 May–30 September 1916, in a test run. 1980 first Sunday of April to last Sunday of September. 1981–1995 last Sunday of March to last Sunday of September. Since 1996 last Sunday of March to last Sunday of October. Switzerland Europe Northern Last Sunday March at 01:00 UTC Last Sunday October at 01:00 UTC Observed DST in 1941–1942 and since 1981. Syria Asia Northern Last Friday March Last Friday October Observed DST in 1920–1923, 1962–1968 and since 1983. Tajikistan Asia Northern – – Observed DST in 1981–1991. Taiwan Asia Northern – – Observed DST in 1945–1962, 1974, 1975 and 1979. Tonga Oceania Southern – – Observed DST from 1999–2002 and 2016–2017. Tunisia Africa Northern – – Observed DST in 1939–1945, 1977–1978, 1988–1990 and 2005–2008. Turkey Europe/Asia Northern – – Observed DST in 1916, 1920–1922, 1924–1925, 1940–1942, 1945–1951, 1962, 1964, 1970–1983 and 1985–2016. Followed European Union practice, although was not a member. In 2016, Turkey joined the UTC+03:00 timezone. Turkmenistan Asia Northern – – Observed DST in 1981–1991. Turks and Caicos (UK) Central America Northern Second Sunday March First Sunday November Observed DST in 1979–2015 and since 2018. Ukraine Europe Northern Last Sunday March Last Sunday October Observed DST in 1941–1943, 1981–1989 and since 1992. Observed DST (commonly referred to as British Summer Time (BST)) since 1916. Year-round Summer Time (BST) + Double Summer Time (BDST) 1940–1945. Two-stage Double Summer Time (BDST) 1947. Year-round Summer Time (BST) 1968–1971. Hawaii do not use DST. Year-round DST observed 1942–1945, and 1974–1975. Uruguay South America Southern – – Observed DST in 1923–1926, 1933–1943, 1959–1960, 1965–1970, 1972, 1974–1980, 1987–1993 and 2004–2015. Uzbekistan Asia Northern – – Observed DST in 1981–1991. Vanuatu Oceania Southern – – Observed DST in 1983–1993. On 8 February 2018, the European Parliament voted to ask the European Commission to re-evaluate DST in Europe. After a web survey giving high support of not switching clock twice annually on 12 September 2018, the European Commission decided to propose to put an end to seasonal clock changes (repealing Directive 2000/84/EC) In order for this to be valid, the European Union legislative procedure must be followed, mainly that the Council of the European Union and the European Parliament must both approve the proposal. ^ "The World Clock". timeanddate.com. Retrieved 26 February 2013. . Detailed information about the history of DST in each country can be found under the relevant section of this website, and can be referred to for information in this chart unless otherwise specified. ^ "Clock changes in Yerevan". World Clock. timeanddate.com. Retrieved 20 February 2013. ^ a b "Sunday, March 10: Daylight Saving Time Begins in USA & Canada". Time Zone News. timeanddate.com. Retrieved 20 February 2013. ^ Time Zone in North Nicosia, Northern Cyprus, Timeanddate.com. ^ "Hora Oficial en los Estados Unidos Mexicanos". Centro Naciona de Metrología. Retrieved 2014-05-01. ^ "GRN evaluates winter time change". New Era. 24 March 2016. p. 1. ^ "Russia returns to permanent Standard Time". timeanddate.com. Retrieved 25 October 2014. ^ "Serbia to legislate Daylight Saving Time, EU may end it - English - on B92.net". ^ "Time zone in Singapore". Daylight Saving Time. timeanddate.com. Retrieved 21 February 2013. ^ "No habrá cambio de hora este verano". ^ "EU Parliament Votes to Re-Evaluate DST in Europe". www.timeanddate.com. Wikimedia Commons has media related to Daylight saving time maps.